For over 25 years, McKnight has been committed to protecting and restoring the Mississippi River. Reduce agricultural runoff into the Upper Mississippi River. Nitrogen and phosphorus enter the Mississippi River from various sources, including wastewater treatment plants, livestock manure, and lawn chemicals. The largest source is fertilizer applied to agricultural crops. Fertilizer can contribute to algae growth and sometimes deplete waters of adequate dissolved oxygen. In freshwater, phosphorus is often the nutrient that sparks algal growth in ponds and lakes, changing the biology of water bodies and sometimes even threatening health. In the saltwater of the Gulf of Mexico, nitrogen is a primary contributor to algae growth and low oxygen levels. By consuming oxygen in the water, algae blooms harm fish and other wildlife. In the Gulf, the blooms contribute to the massive seasonal “dead zone,” destroying marine habitats. High levels of nitrates are also hazardous to humans, and have triggered costly water treatment interventions in several communities in the Mississippi River basin. In Minnesota, Wisconsin, Iowa, and Illinois, we support efforts to grow commodity crops more sustainably, as well as projects that support more diverse cropping systems. Restore the natural hydrologic function of the Mississippi watershed. The water cycle—or hydrology—of the Mississippi watershed has been altered by centuries of changes to the landscape, in particular the disappearance of wetlands to make way for farming. The water cycle has also been affected by how quickly agricultural drainage systems move water off farm fields, and how ditches, channelized streams, and rivers move that water farther downstream. This altered hydrology not only worsens flooding, it also impairs a watershed’s natural ability to filter and absorb pollutants. The continuing development of land for agricultural and urban use has diminished the floodplains, further limiting the river’s capacity to filter pollutants and reduce peak flows. Along the Upper Mississippi River and in the delta, we fund efforts to restore floodplains and wetlands, manage agricultural drainage, and expand sustainable agricultural practices. Making change on the scale of the Mississippi River system is complex. The day-to-day decisions of millions of people affect how land is used and how water flows through the landscape. consumer interest in sustainable farming practices. adoption of crops and farming practices that protect soil and water. We primarily focus on the main-stem states of the Upper Mississippi River, a landscape and river system that has been dramatically transformed over the past 200 years. We fund efforts to restore the functional hydrology in the river corridor and reduce the agricultural pollution in Minnesota, Wisconsin, Iowa, and Illinois. McKnight also supports efforts to address coastal land loss and other Mississippi River–related environmental challenges in Louisiana. We provide limited support for national water issues that have a significant impact on the Mississippi River. innovation to develop new agricultural products and practices, as well as new approaches to conservation. scale and scalability to achieve system-wide impacts. testing and learning to refine solutions over time. capacity building to enable advocates to develop new policy recommendations. inclusion and equity to ensure that all communities along the Mississippi have opportunities to define what a resilient Mississippi River means to them, regardless of geography, income, race, or ethnicity. Equity ensures that all communities benefit from a healthy, resilient river system. Our logic model is the practical map from our two strategies, through our program’s many activities, and ultimately to the outcomes we strive to achieve. In addition to grantmaking, our program supports convenings, policy work, research, and relationship building. 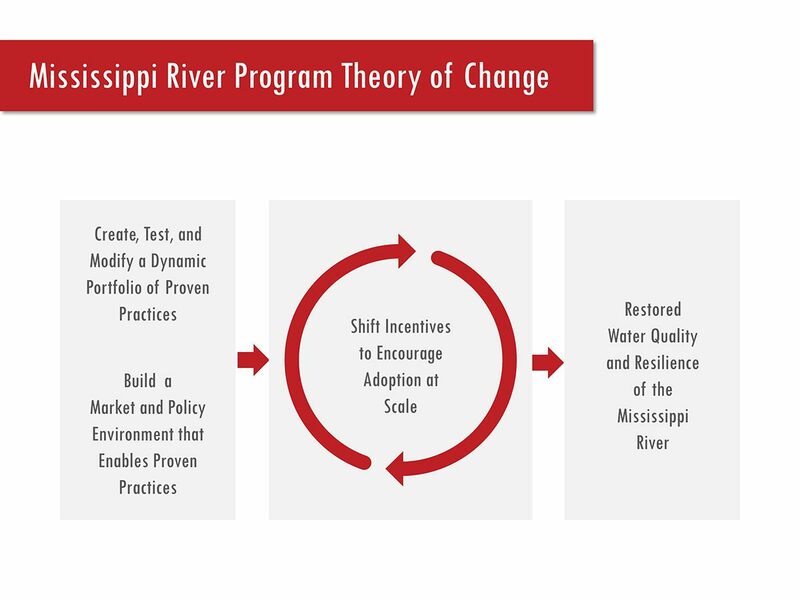 The Mississippi River program’s Theory of Change centers on the incentives that drive decisions impacting the river. Our approach is based on an understanding that long-term change relies on a virtuous circle: As new practices and products are adopted, they begin to transform markets, policy, and cultural norms. Over time, these transformations provide ever-stronger incentives for adopting new practices. 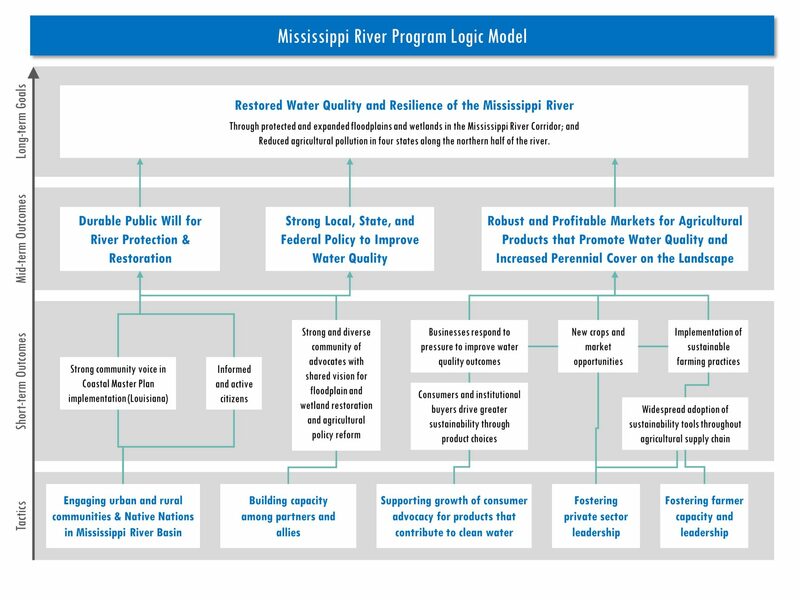 This self-reinforcing dynamic brings new practices to the scale needed to improve the quality and resilience of the Mississippi River system. This can eventually turn into common practice. Portfolio of proven practices. We seek out and encourage the adoption of practices that reduce impacts to the river and restore its function. Demonstrating the viability of this emerging portfolio helps overcome people’s natural risk-aversion to new products and practices. It also encourages further innovation. Enable market and policy environment. 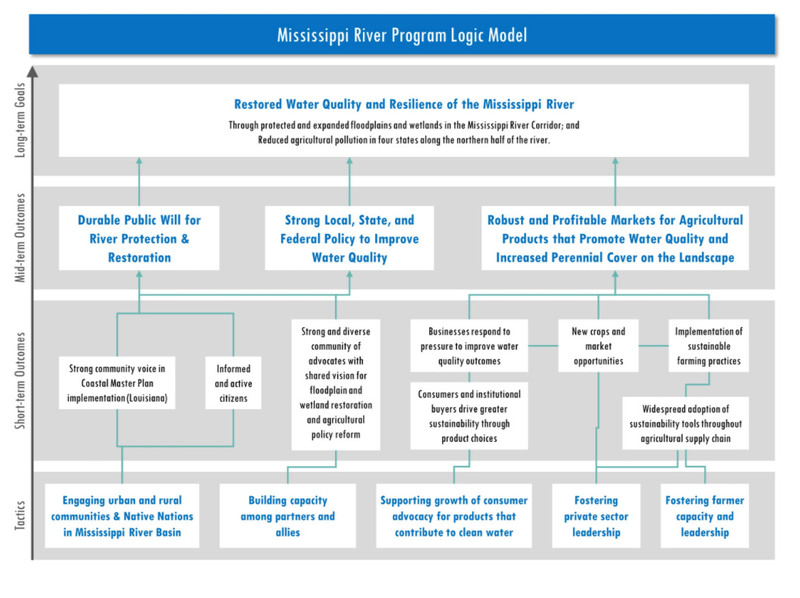 Individuals and organizations whose decisions and behaviors impact the Mississippi River are strongly influenced by markets and government policies. We seek to create new market opportunities and policy incentives that encourage adoption of undervalued products and practices. Focus on incentives. Changing incentives over time relies on a virtuous circle. We focus on the economic returns, risks, regulatory requirements, culture, and community values that drive decisions impacting the river. As new markets mature and become more predictable, risks become better understood. Markets and policies adapt to manage those risks. New rules gain acceptance as common practice. Companies and organizations accept new ways of doing business, and communities come to expect emerging practices. Those are the long-term dynamics of our Change Engine. Outcomes. As new farming and land practices are adopted at scale, nutrient loads in agricultural runoff are reduced, changes in drainage systems preserve wetlands, and the natural hydrologic function of the watershed is restored. The cumulative impact is improved water quality and resilience of a river system as large and complex as the Mississippi.